Building a doghouse that's perfect for your dog can be a rewarding, entertaining process. However, you have to do it with a plan, and you have to know what your house should do. You'll get lots of different advice when it comes to building a dog house, but in the end, it has to suit the needs of your specific dog. To be a good dog house, it doesn't need to be complex - it just needs to keep your dog dry and comfortable, as well as safe. Let's take a look at ways to build a house for your pet. The big thing any doghouse should do is be dry inside and stay that way. While rainy days might result in some water being tracked in, the house should generally be dry. However, even when it's been properly waterproofed, humidity can be a problem. Mold and bacteria can grow in humid areas, so a house that has proper ventilation and won't get too humid is important. 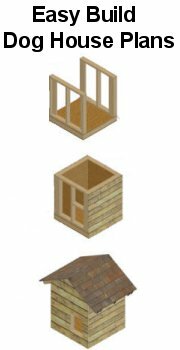 Wood houses generally breathe automatically to some degree, since they are made of a porous material. However, vents or a flap type door can significantly improve the dryness. You may be tempted to build a house for your dog that's well insulated and even heated. However, you should understand that dogs don't need the same level of warmth that people do, since they have fur and are relatively resistant to the elements. Even short haired dogs have a lot of insulation against the cold. That means that while protection from the elements, particularly rain and wind, is important, you shouldn't put a heat source in, and you should avoid over insulating. Your dog is used to cool temperatures, and may get hot in a house that you would consider comfortable. Any insulation used should be well covered, since dogs may chew on and ingest exposed insulation. This can be very dangerous. A hollow wall with airspace is the best form for a dog house, since fiberglass can contribute to rotting wood in the summer. You can build your dog's house too big. People don't like to sleep in huge spaces, and neither do dogs. Build a house that's large enough for your dog to fit while lying down, plus about three inches on each side. Make the height four to six inches taller than your dog's shoulders. Remember that your pet's body will be heating the space in the dog house, and that dogs prefer a cozy den to a spacious palace. Plastic and wood are the best materials if you're making your own dog house. Both can be disinfected to some degree, are durable, and can have good ventilation with the right design. Some owners who want to build really durable houses use concrete blocks or metal. However, these tend to be chilly and damp in bad weather, making them poor choices. Metal covering on the outside of a wooden house can be an excellent method, however. Prefabricated plastic houses are also surprisingly good. Doghouse doors, bedding, and other supplies like dog clothes can be obtained by shopping online or looking at local stores. You can even buy entire dog houses if you don't feel like making your own. Take a look at all the options and create the perfect environment for your pet.